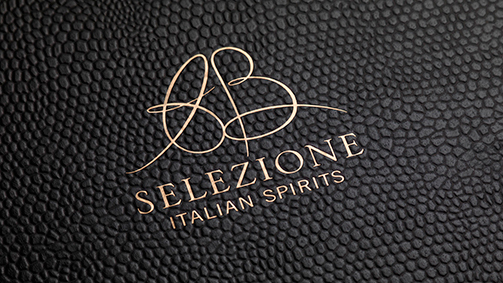 Having left the family business, a milestone in the history of distillation, since 2014 Antonella Bocchino has been dedicated to the AB Selezione Italian Spirits project. Her mission is to collect the best Italian spirits produced from the finest grapes and pomace from around the country. 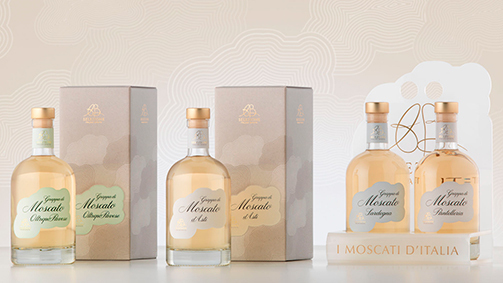 The most prestigious grappas of Moscato produced with pomace from different regions around Italy, are distilled in Piedmont and aged in oak barriques (toasted to varying degrees), as well as other great Italian spirits: three vintage grappas, two single variety cru grappas, Moscato d’Asti and Nebbiolo da Barolo, and two liqueurs recovered from the ancient tradition of Piedmont. 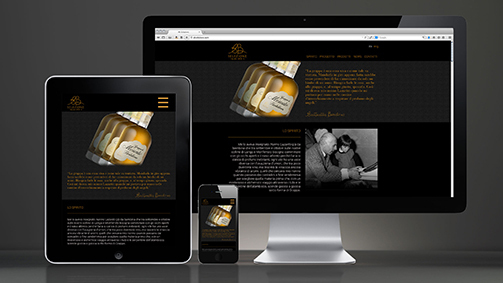 An interview with Antonella Bocchino: on the Moscato trail with the lady of grappa from SGA Wine design on Vimeo. Antonella, what intuition led you to begin this new project? AB Selezione is the result of the desire to select the best of what craft distillation can offer in this country, treasures hidden in the cellars of small artisanal distilleries that often go unappreciated. The project is a search for grappas, mainly, but also Italian spirits in general, which can be found in abundance throughout the country and are almost always the quintessential expression of a territory, a region, or a microclimate. During my search, I have been able to collect samples of these drinks, and I have discovered that they contain some spectacularly pure and unique aromas and perfumes. Hence “Italian Spirits”: in the plural, because from the Alps to the islands of the Mediterranean, different spirits, grappas and liqueurs represent the immense and diverse beauty of Italy. My wish is to reveal the splendour of our country through the beauty of artisanal distilling. Does promoting the grapes of Moscato represent an opportunity to safeguard biodiversity as well as development for the region? The heart of the AB Selezione project is the exploration of the Moscato grape variety. I was born in Canelli, the homeland of Moscato d’Asti, and so the starting point had to be there, where my roots are, where my memory recalls the intense perfumes and aromas of this variety. Nevertheless, almost every region in Italy cultivates a Moscato: and this was the most fascinating part of this journey, finding out whether this grape, with its intrinsic biodiversity that produces incredibly diverse wines, could also produce diverse grappas. As Gino Veronelli first showed me, the Moscato di Chambave, a Moscato from which very few bottles are produced in Val d’Aosta, just below the snow line, is certainly different to a Moscato di Pantelleria, cultivated in the heart of the Mediterranean island, where the sea air wafts through the from every direction, in an igneous terrain rich in minerals, which inevitably enhance the final product. Researching the diversity of this grape variety, in its unique incarnations in every region in Italy, was the challenge I took on: and it is a wonderful and compelling adventure. The appreciation of these diversities has taught me to recognise a unique characterisation, a fil rouge that links all these grappas: it’s the most intriguing thing about Moscato, the aromas, a softness present in all five (soon to be six) grappas of the Moscato AB Selezione. It is a connection that unites these spirits: whose strong personalities and individualism are owed to the biodiversity of this grape variety. A trip like this, on the trail of a wonderful and ancient vine variety, I think is only possible with Moscato. There are no other grape varieties in Italy with such a diverse range of examples. Now, talking about how these grapes help the development of a territory, we have before us two very significant episodes: one is the declaration of the Langhe, Roero and Monferrato as UNESCO World Heritage Sites, which the Moscato di Canelli is a part of; the other, UNESCO declared the ‘alberello’ method of cultivating Moscato di Pantelleria as World Heritage. For the first time, UNESCO recognised an agricultural practise, giving important recognition to the biodiversity and uniqueness of the territory, an appreciation that will also surely have a significant impact on tourism and wine tourism in particular. You have travelled the length of Italy tracking down the best Moscato grapes, produced in diverse Italian regions. What are the differences and what are the constants you found on this journey? As I said, a constant of the Moscato is its beauty: this perfumed, fragrant grape variety has a unique capacity to release aromas that are always different, but intense, in each one of the regional grappas. It is something I rarely find in other grape varieties. The diversity of the different Moscato grapes is truly fascinating. When I began to taste the various Moscato grappas blind, fresh from the alembic, I realised as I closed my eyes that it was like travelling through Italy. I began my journey at my roots, from the perfumes of wisteria, acacia flowers, the white flowers of our Moscato d’Asti, which my grandfather showed me when I was in pre-school, when they were given to children with ‘meliga’ biscuits or with a slice of panettone at Christmas. A moment later and I was breathing the perfume of the Moscato from Sardinia, with its enthralling history: the Moscato grapes were taken to the island under the rule of the House of Savoy with the aim of increasing production, but there they produced a wine and a grappa that were completely unique, and very different to what they knew of Moscato in Piedmont. The Sardinian grappa, at the end of tasting, has hints of the sea air, of salt from the sea surrounding the vineyards; some have compared it to a highland whisky, with which it does have many things in common. My journey continued with the rich aromas and compelling history of the Moscato of Pantelleria: zabib (Zibibbo), a grape variety brought by the Arabs, means a sun-dried fruit, and I find in fact that the Moscato grappa from Pantelleria fills the glass with fruity scents: grapes from Cyprus, aromas of dried figs. This Moscato too is unique, with its own distinctive and recognisable personality. Then the other Moscatos, each with a different character and personality: from the Moscato of Oltrepò Pavese to the Rosé Moscato of Trentino Alto Adige, cultivated on the slopes of the Dolomites in a rocky terrain, with its surprising fragrances of peach and rose, extraordinary sensations with the eyes closed. Finally will come the grappa of Moscato of Trani, from the Apulia in the beautiful south. It will have another unique aroma and taste. But it has just been distilled and is aging in barriques, t o be ready next season. 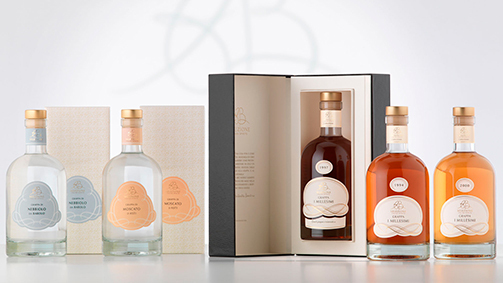 The AB Selezione Italian Spirits project includes three prestigious vintage grappas and two single variety cru grappas. Can you tell us about these? The two single-variety grappas are the flagships of Piedmont; they couldn’t be excluded from a line of clear “Piedmonticity”, at the heart of which is the Moscato di Canelli. The grappa of Moscato d’Asti is fresh, young, and contains all the fragrances of a harvest just completed. It is dedicated to the lovers of grappas tout court, those who don’t want it contaminated by the wood of the barriques and prefer to enjoy its purity, fresh from the alembic. The grappa of Nebbiolo da Barolo is the other side of the aromas of Moscato: it is very dry and austere, produced from pomace from one of the eleven small towns that produce Barolo: Serralunga d’Alba, within the UNESCO World Heritage territory. 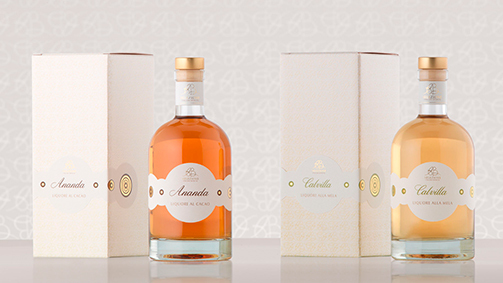 Where did the idea come from to revive Ananda and Calvilla from ancient tradition, the liqueurs of cocoa and apple? We worked on two fronts, if I hadn’t been accompanied by two extraordinary partners in this operation, Ananda and Calvilla wouldn’t have been possible. Ananda is the fruit of a collaboration with Guido Gobino, a great master chocolatier of Turin, who provided me with the finest of his cocoa selection. We infused the cocoa beans from the plantations of Ecuador, a cocoa “cru” called Arriba Superipor Selecto, with alcohol for six months. The result was a harmonious marriage between the alcohol and the cocoa: the latter relinquishing its aromas and the mahogany red colour typical of the Criollo. 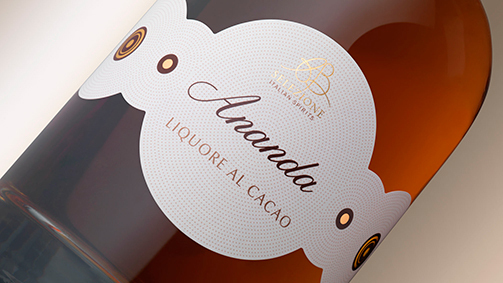 Ananda means blessedness in ancient Sanskrit: the liqueur is a synthesis of pleasure and purity, the quintessence of cocoa in a drop of alcohol. Calvilla was the product of my collaboration with Slow Food, which safeguards a historic variety of Piedmontese apples called Calvilla, originally imported from France, from a small town on the borders between Flanders and the Alsace: Calville, the town that produces most of the apples used for Calvados. For the production of this liqueur, we use the same apples, although in this case they are not distilled, but sliced and left to interact with a brandy for a year. This produces another liqueur with a low alcohol content (both are 28%), which are very easy-drinking at the end of a meal and a perfect accompaniment to desserts or pastries. It’s also loved by the younger generation of mixologists, bartenders who want to make their mark with sought-after ingredients and niche products to allow them to propose extraordinary cocktails. I tried a spectacular Martini with a Calvilla base, and a fantastic cocktail called “Poetry” made with Ananda, drops of Angostura and Barolo Chinato. Just over a year since the launch, it is possible to reflect on the recent past and the future of the project? The recent past has been exciting, fascinating, a wonderful year full of new experiences, searching, discoveries and rediscoveries: rediscoveries of old friends, restaurant owners, wine store owners, who have all contributed to this adventure with enthusiasm. The present heralds many new developments for the coming months and years. This year, AB Selezione has introduced itself to the world at several events: Salone del Gusto in Golosaria, Banca del Vino at the University of Pollenzo, Eataly. We also attended several fairs abroad: the fair in Dusseldorf was particularly interesting because AB Selezione was the only table of Italian grappas in the midst of the world’s finest spirits. It is called Acquavite, and there were whiskies, rums, gins, tequilas: AB Selezione made a great impression and we are very happy and satisfied. Challenges of course are endless: 2016 will be a year of expansion, we hope, especially abroad because grappa, in my opinion, even though it has been gaining recognition in recent years, still has to make its mark, and we are here to greet it when it does.